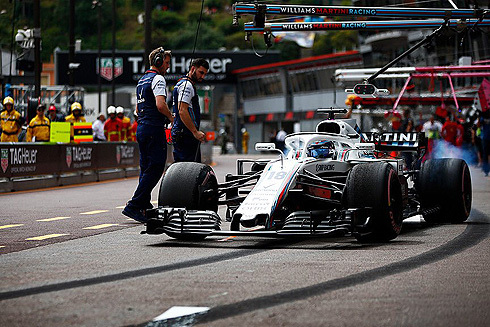 The opening Thursday practice session for the 2018 Monaco GP would see Williams Martini driver Sergey Sirotkin finish in an impressive 10th. 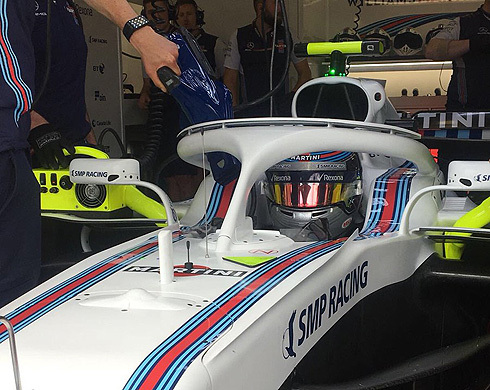 His team-mate Lance Stroll would have a far more difficult session finishing in 18th. Both drivers would have issues during the session with Sergey making contact with the barrier damaging his right rear wheel and suspension. He was forced to pit for a lengthy stop but upon his return would set a time seeing him 6th dropping to 10th. Lance would have a session that would see him struggle with the setup of his car as well as complaining about moving around in his seat. With the start of the opening Friday practice session there would be a mixture of tyres been used covering the supersoft, ultrasoft and hypersoft. Bottas and Hamilton would be quickest with Bottas setting a 1m:17.299. Bottas would improve with a 1m:15.697 to remain quickest but Sergey would improve with a 1m:15.780. to be quickest. But Hamilton would move ahead with a 1m:15.229 but it was changing quickly with Bottas again fastest with a 1m:14.882. Both Mercedes were on the ultrasoft tyre. 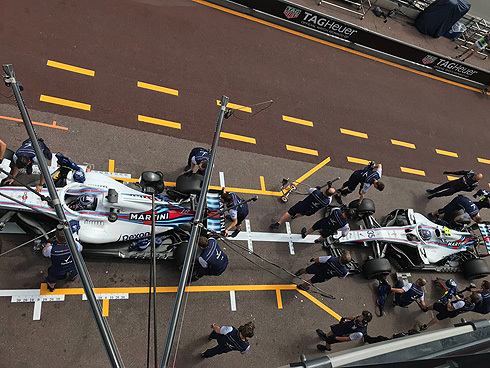 After the initial runs the Williams drivers were third and fourth running on the hypersoft tyre. Ricciardo would go third on the hypersoft tyre with a 1m:15.289. Bottas would improve with a 1m:14.347. Ricciardo would move to the top of the times with a 1m:14.103. The Williams drivers were now fourth and fifth as they continued their runs. Thirteen drivers had set times but this would increase with Verstappen now second followed by Bottas and Hamilton. Raikkonen was now fifth but his team-mate would move up to third followed now by Bottas and Hartley. Ricciardo was able to improve with a 1m:13.139 again quickest. With both Williams drivers back in their pits with an hour remaining they weer 16th and 17th. Again Verstappen would go quickest with a 1m:12.941. He would improve with a 1m:12.723. The track would empty as drivers returned to their pits to hand back their tyres to Pirelli. First back out were the Mercedes drivers. Hamilton would go quickest with a 1m:13.038. The order was now Hamilton, Verstappen, Ricciardo, Vettel, Bottas, Sergey in sixth. But Ricciardo would move up to fifth seeing Sergey now 7th. Vettel would continue to improve moving up to third but Ricciardo would take this spot back. With just over thirty minutes remaining the Williams drivers were in 9th and 16th. Verstappen was fastest with a 1m:12.280. As the final thirty minutes of the session wound down it would be Ricciardo who would go quickest with a 1m:12.126. He would be followed by Verstappen, Hamilton, Vettel, Raikkonen, Sainz, Bottas, Perez, Grosjean and Sergey. So we had the Williams drivers in 10th and 18th with Sergey in a very encouraging top ten finish. But Lance was 0.820 of his team-mates time. Lance would be first out for Williams running on the hypersoft tyre. lance would set a 1m:19.186 to go ahead of his team-mate. He would follow this with a 1m:17.349. Lance would improve with a 1m:15.960 currently in tenth, dropping to 13th. Lance would say that his front tyres are graining seeing him pit after a 15 lap run. He would pit taking on a new set of hypersoft tyres returning to the track. He would have a moment that would see him pit again currently 17th. Lance would also come back out and would improve to be tenth with a 1m:14.782. He would come on his radio saying that he could not go any quicker as he was not happy with the balance of his car. He was currently 14th. lance would continue his run on the hypersoft tyre. Lance would also complain that he was moving a lot in his seat and he would pit currently 16th. With the end of the session Lance would complete 23 laps on his hypersoft tyres having dropped to 18th. Lance had said: "The fronts just go away and away and away. I get to the point where I can't turn the corner." Sergey would also use the hypersoft tyre for his installation runs. Sergey would set the first lap time with a 1m:19.249. Sergey would improve with a 1m:16.717 to be quickest. He would drop in second. But he would improve with a 1m:15.697 followed by a 1m:15.387. But he would have to pit after making contact with the barrier with his right rear tyre seeing him limp back to his pit. He would be wheeled back into his garage to assess the damage. He had surprisingly make contact with the barrier as he was running on the main straight. Even though he had to pit Sergey was currently sixth dropping to eighth. This would become 16th as his mechanics worked on his damaged car. Sergey was able to get out again and would improve back to be sixth with a 1m:13.962. He would drop to seventh then eighth. Sergey would continue his run on the hypersoft tyre. He would pit after a thirteen lap run, currently ninth. With the end of the session Sergey would finish in an very encouraging 10th.